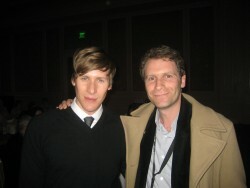 Yesterday I made a last-minute detour to Vegas for a conference, where I met Lance Black, screenwriter of MILK.I’ll have more pics up soon from Vegas and other spots desert, tropical, and semi-tropical. And I’ll also let you know how the tour wrapped up and what to expect from the blog in coming weeks–we’re not stopping now!! This entry was posted on Sunday, March 22nd, 2009 at 5:18 pm. You can leave a response, or trackback from your own site. Your book is an amazing read. I’m sending copies of it to my representatives. Gays in the military have been forced to serve in silence for too long. It’s cruel to keep someone from being themselves. It’s part of the pursuit of happiness and I just don’t get how we can be the land of the free, unless you are gay. If anyone should be fighting for the rights of our gay brothers and sisters it should be the USA. We are all over the world promoting democracy while we stifle the rights of gays in our own country. Isnt’ that bigotry?